With an objective to lead the way, we are committed to manufacture, export and supply a quality range of Expendable Roller Conveyor. Offered conveyor is exactly manufactured using superior grade components and latest technology under the strict guidance of our highly skilled experts as per the set industry standards. 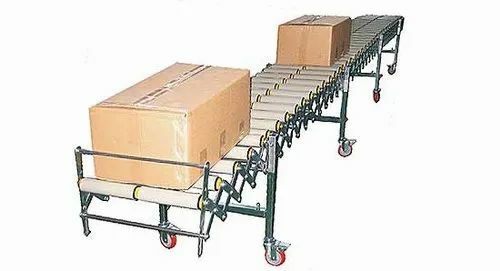 The provided conveyor is used in several industries for moving big size cartons from one place to another safely. To fulfil the precise needs of clients, we offer this Expendable Roller Conveyor in different specifications as per their needs at reasonable rates. "Smart Packaging System" was established in the year 1998. Based at Indore, Madhya Pradesh (India), we are engaged in the manufacturing, supplying and exporting a broad assortment of Packaging Machines, Sealing Machines, Wrapping Machines, Strapping Machines, Welding Machine, Packaging Material, Industrial Doors, Inkjet Printers, Banding Machine. Our range of products includes Stand On Weigh Filler Machines, Vacuum Packaging Machines, Electronic Rotary Contact Coders, Shrink Chambers, Shrink Packing Machines, Automatic Continuous Band Sealers, Band Sealing Machines, Plastic Film Sealers, Continuous Induction Sealers, Carton Sealing Machines, Automatic Carton Sealing Machines, Vertical Type Sealing Machines, Pallet Stretch Wrapping Machines, Shrink Wrapping Machines, Fully Automatic Strapping Machines, Semi Automatic Strapping Machines, LED Welding Machines, Shrink Label Stickers, PVC Strip Doors, Light Traffic Interior Doors, Heavy Traffic Exterior Doors, High Speed Inkjet Printer and Automatic Banding Machine among others. We make use of premium grade steel to manufacture our range of products due to which these products exhibit high performance, longer service life and require minimum maintenance. These products are mainly used for the packaging of the products. We have appointed a team of experts that are always on their toes to bring forth an impeccable range of products. Our in-house R&D unit keeps our professionals updated with the latest technological advancements. Backed by a state-of-the-art infrastructure that is equipped with all the tools and techniques, we are able to meet bulk client's orders. We have employed a team of packaging experts, which offers facility of customized packaging. Our products have a deep reach to both, Indian & International markets which includes Indian Subcontinent, East Asia, Middle East and South East Asia.